The Blank Pressed Penny Souvenir Book is made of black vinyl with a clear vinyl cover to insert your own cover or one of our custom covers. The Blank Pressed Penny Souvenir Book, opens up with three flaps. The book holds 40 pressed pennies, as well as space for 4 pressed quarters or nickels. This souvenir book is a great way to store and display your smashed pennies! 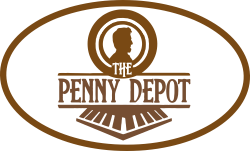 The Blank Pressed Penny Souvenir Book are a favorite among Elongated Coin Collectors.